^ 1.0 1.1 1.2 1.3 1.4 Notes for Planet Kepler-22 b. Extrasolar Planet Database. [6 December 2011]. ^ Notes for Planet Kepler-22 b. Extrasolar Planet Database. [6 December 2011]. 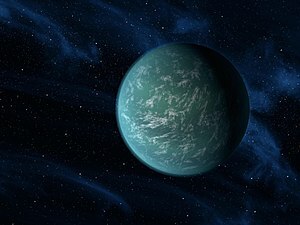 ^ 4.0 4.1 Planet: Kepler-22 b. The Extrasolar Planet Encyclopedia. [14 December 2011]. ^ 7.0 7.1 7.2 7.3 7.4 7.5 7.6 NASA – NASA's Kepler Confirms Its First Planet in Habitable Zone of Sun-like Star. NASA Press Release. [6 December 2011]. ^ 8.0 8.1 8.2 8.3 8.4 8.5 8.6 8.7 8.8 Kepler 22-b: Earth-like planet confirmed. BBC Online. 5 December 2011 [6 December 2011]. ^ Dr. Tony Phillips. Kepler Confirms First Planet in Habitable Zone of Sun-like Star. NASA science news. 5 December 2011 [31 January 2012]. ^ gives the definition of "Neptunian", among others. ^ 13.0 13.1 Abel Mendez Torres. Updates on Exoplanets during the First Kepler Science Conference. Planetary Habitability Laboratory at 波多黎各大學阿雷西沃分校（英语：University of Puerto Rico at Arecibo）. 2011-12-08. ^ alien planet found in habitable zone - discovery 互联网档案馆的存檔，存档日期2012-01-07. ^ Borenstein, Seth. Planet in sweet spot of Goldilocks zone for life. Associated Press. 5 December 2011 [6 December 2011]. （原始内容存档于2012-09-05）. ^ Ian O'Neill. SETI to Hunt for Aliens on Kepler's Worlds. Discovery News. 2011-12-05. ^ Stephens, Tim. Newly discovered planet may be first truly habitable exoplanet. University News & Events. 加利福尼亞大學聖塔克魯茲分校. 29 September 2010. ^ NASA, Mars: Facts & Figures. [28 January 2010]. ^ Mallama, A.; Wang, D.; Howard, R. A. Venus phase function and forward scattering from H2SO4. Icarus. 2006, 182 (1): 10–22. Bibcode:2006Icar..182...10M. doi:10.1016/j.icarus.2005.12.014. ^ Mallama, A. The magnitude and albedo of Mars. Icarus. 2007, 192 (2): 404–416. Bibcode:2007Icar..192..404M. doi:10.1016/j.icarus.2007.07.011. ^ Kipping, D. M.; Forgan, D.; Hartman, J.; Nesvorný, D.; Bakos, G. Á.; Schmitt, A.; Buchhave, L. The Hunt for Exomoons with Kepler (Hek). Iii. The First Search for an Exomoon Around a Habitable-Zone Planet. The Astrophysical Journal. 2013, 777 (2): 134. arXiv:1306.1530v1. doi:10.1088/0004-637X/777/2/134.